Exciting news for Alaska bound fly casters. Wild River Guide Company was awarded an exclusive use permit for Togiak River fly fishing trips on the Togiak Wildlife Refuge west of Dillingham, Alaska. 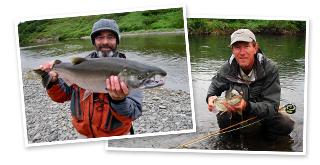 The Togiak is an exceptional wilderness river for King Salmon and Sockeye in July and Dolly Varden Char and Coho Salmon in August. There are some legendary Rainbow Trout. The July King Salmon run averages well in excess of 10,000 fish and more than 100,000 Sockeye return. The August Coho run is close to 10,000 and the July and August return of Dolly Varden Char is staggering. In the coming weeks look for the 2012 Season Report where we’ll report on a week long raft trip with wounded warriors fly fishing down the Togiak. Share a camp with me on the Togiak next summer!